Hyde Park, London, England. 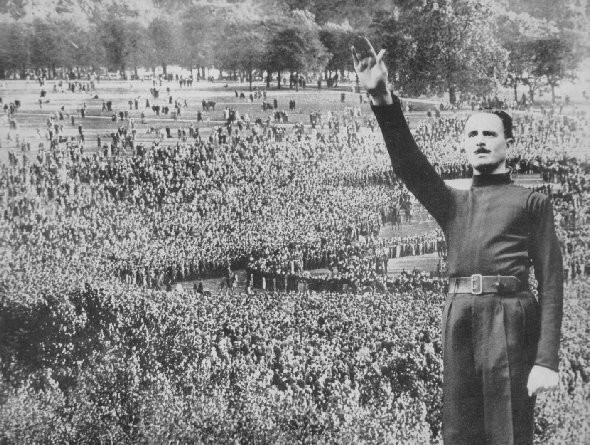 Sir Oswald Mosley, leader of the "British Black Shirts," giving the salute of his men. Many persons were injured in the riot following this meeting. Similar monster demonstrations are common in all nations where the white races predominate. riots, rebellion, bloodshed, mark the record of Ambition's brutal march to power. The history of the past two decades is a record of violence, revolt and counter-revolt against existing racial and economic conditions in countries which have abrogated the accepted rules of government. Leading the procession is Russia (U. S. S. R.). Across the pages of its history travel the strong menKerensky, Kornilov, Lenin, Trotsky, and dictator Stalin. The Russian Government. Behind this European turmoil is class hatred largely engendered by Russian Communists. The Government of Russia, which is known as the Union of Socialist Soviet Republics (U. S. S. R.), is governed by a dictator assisted by a small group of executives. Joseph Stalin, the secretary general of the Communist Party, is the actual dictator. The Communist Party consists of about 3,000,000 members, out of some 165,000,000 people in Russia. (The Bolsheviks numbered only 79,000 at the time of the Russian Revolution.) It controls the Soviet Government and the Communist International. The communists are now threatening the United States. Immediately after the creation of the Communist International at Moscow, in March, 1919, a call was issued for the organization of Communist Parties throughout the world and their adhesion to the Russian Communist International. *For detailed history of this epoch making period see Progress of NationsComplete History of Civilization, 10 vols. Published by Disabled American Veterans. Dept of Rehabilitation, Chicago.